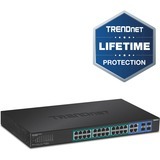 TRENDnet's 28-Port Gigabit Web Smart PoE+ Switch, model TPE-2840WS, delivers advanced management features with a 56Gbps switching capacity. This rack mountable IPv6 ready switch comes with an intuitive web-based interface. Advanced traffic management controls, troubleshooting, and SNMP monitoring make this a powerful solution for SMB networks. The TPE-2840WS provides 24 gigabit PoE+ ports with a total power budget of 185W, and four shared gigabit ports (RJ-45 or SFP). The PoE+ standard supplies up to 30W of power per port for devices such as high power wireless access points, PTZ (Pan Tilt Zoom) Internet cameras, and VoIP telephony systems.